check latest discussions within topic as well as the source code and each commit for all changes. support only firmware version 1.0.1. 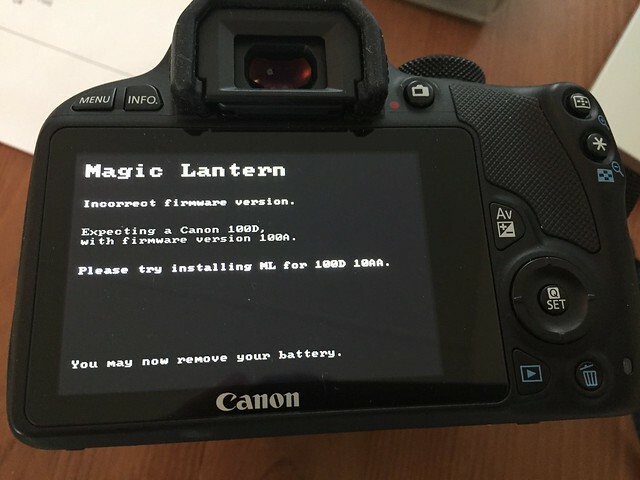 Please download from Canon's website if you are still running firmware version 1.0.0. Dropping hereby support for previous builds based upon fw 1.0.0. Archiving changelog history to the 2nd post. Please read through it before running ML for the first time. enabled focus features (untested by me). YOU test them in detail. I want full reports on all (sub-)features. No 1-liners or it might get removed in next build again. Up to you! Removed PRs marked (untested) from previous release (see below). Those will get included automatically by merging unified in next release. Silent Pictures appears to be broken (SAVE DNG error). Still I have removed all older builds prior to this build. We will have it fixed in an upcoming build again. tried to fix the "dirty" ML menu which appeared in LV / movie mode. This is what I am mainly after. YOU try hard to get it "dirty" again by switching forth and back from photo mode to LV/movie mode etc and tell us if you encounter it again. synched up with unified branch so check the source over there to see what has changed in the last months (lots of stuff thanx to a1ex). Download only for 100D.100A/B. Revision C has to wait. Q-menu has been "force-overridden" to act as SET button (we need this for ettr etc. Guess we will bring it back by doing a long-press in one of the next releases. For now you have to live with it and make your adjustments by touchscreen in pure photo mode. If you encounter freezes / crashes then take out your battery. Try to reproduce and report your findings. ML menu might have some artifiacts from time to time and you might also see some flickering. my tests show that switching to play mode and back solves that issue in most cases. *Edit* one of the best part is the half shutter magic-zoom... LOVE THIS quick and efficient feature! -lastly ETTR applied to most, if not all. Messed around with MLV HDR, Dual-ISO in varieties FPS, converted with MLP and conformed entire timeline into 23.987 in DR 12. It's not perfect because I need FPS override to work in order to smooth out the flicker in some of the Dual-ISO shots. Still pretty awesome for a tiny beast that costed less than $300 to scoop up a used body! •Possible ScreenFlow of how to do's regarding Post-Workflow (if necessary) depending on how many user errors. Thanks to @nikfreak for his never-ending contributions as well as to @a1ex & @g3gg0 for getting him up to speed! Using the 100B version worked like a charm. Installed on my camera ("B" build), works fine, i need to familiarize with ML and learn how to use it, i supose that mostly parameters cant change because "Q/SET" button as the same (described in changelog), but hope this will be fixed soon. Thank you very much for your job, i will test it deeply when i have time. @Xinixato -- Don't forget you can also push 'Av' button as an enter/back button which can be tricky but works well for the most part. @koenkooi -- Good catch and Thanks for sharing! Nice! @DeafEyeJedi, i tried buttons but not noticed AV can do this, thank you!! Hi, cool to see ML on the 100D. I wanted to try to capture a dual iso video and could play it in the ML file manager. Then i disabled the "allow Frameskip" in Picture Mode since the ML menu keeps disapearing in Video Mode and upon changing to Video Mode the Camra crashed. I couldn't reproduce it, maybe because i missed a step (i'm pretty new to ML) or maybe it was a random crash. I nonetheless hope the logs might help. PS: Seems like I can't attach files. Where should I put them if they might be interesting? Neither install works for me. Both come up with incorrect firmware version. Possibly a rare 3rd build? I would be happy to try dump the firmware if someone could walk me through the process or link me to somewhere to that effect. @nikfreak, expect a pm has been sent about my fw shortly after I post this. Thanks for all the hard work either way. I am super envious of all you guys getting ML awesomeness. Felipe can you update your signature as instructed in 1st post? @all: After checking @clivewattsrsa's dump I can confirm that there's a 3rd revision of the firmware floating around. Good catch, @clivewattsrsa and thanks for confirming this @nikfreak! More fun stuff w HDR Video ... even works with H.264 for those who can't handle RAW. Converted & exported with ease from @Danne's app called MLP which works really well for OS X. But still, thank you very very much for your great work! Will post other bugs if i find some and help this camera make the best it can be! Your video is set to private mate. We can't watch it. DeafEyeJedi, HDR Video looks like a very useful tool. The clip at full 1080 ( So my Anti aliasing Moire filter works ) H264 has to be post processed, to avoid the flickering, What app can do that ? Let's please try and stay on topic. @canneloni: movie crop mode active? Got wrong numbers in LV only, too?